WOLVERHAMPTON defied the odds to emerge with a brilliant 47-43 win from the Premiership Grand Final first leg at Swindon. With the Parrys International Wolves missing their Swedish spearhead duo of Freddie Lindgren and Jacob Thorssell through injury, many fancied table topping Swindon to gain an advantage from their home leg. 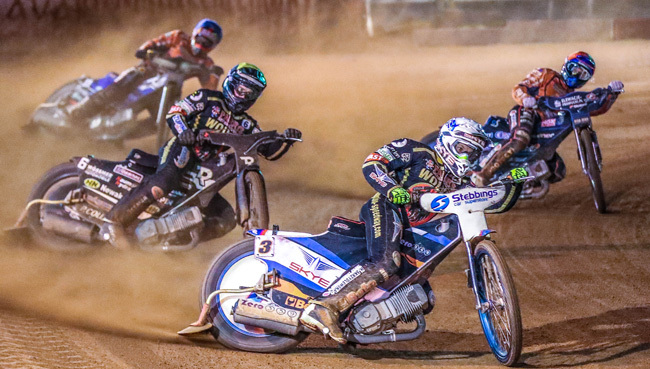 But the Parrys International Wolves rallied together to produce a solid team performance to earn a four point lead themselves ahead of Wednesday's decider at Monmore Green (7.30). Stand-in skipper Rory Schlein said: "We warned everyone in the build-up that our attitude and approach wasn't going to change and we went out and backed up those comments on track. "Some people were writing us off because we were without our top two but people telling us we were understrength and the underdogs suited us down to the ground. "We made an outstanding start and we were leading by 12-points after Heat Nine but credit to Swindon they came back at us a little in the closing stages of the meeting. "But we're not disappointed at all because at the end of the day we came here to win, which is what we've done, and we've piled the pressure on Swindon. "They were bickering and squabbling among themselves all the way through the meeting and that's how we knew we'd got them rattled. "We knew we were doing something right when that started going on and that spurred us on even more. "It's far from over yet though and Wednesday is going to be a massive night at Wolverhampton with all still to play for!" A full preview ahead of Wednesday's Grand Final second leg will be issued on Tuesday afternoon. SWINDON 43: Jason Doyle 11, Nick Morris 9+1, David Bellego 7+1, Tobiasz Musielak 6, Bradley Wilson-Dean 4+1, Liam Carr 4, Adam Ellis 2+1. WOLVERHAMPTON 47: Sam Masters 12+1, Rory Schlein 11, Chris Harris 9+1, Kyle Howarth 7+3, Mark Riss 5, Nathan Greaves 3+2, Jacob Thorssell R/R.